Hwagyesa Temple was first founded in 1522 A.D by the monk Shinwol. Tragically, the temple was destroyed by fire in 1618. It wasn’t until 1866, through financial support from royal elders, that the temple was rebuilt to its past glory. There are numerous buildings at the temple to enjoy like the Daeung-jeon main hall, the Myeongbu-jeon Hall, as well as the Samseong-gak shaman shrine hall. In addition to these buildings, a visitor can enjoy a small spring to the rear of the temple, and up a valley, called Hwagye-gol. The spring water from Oktak-cheon is said to have curative properties for skin and stomach ailments. Visitors to the Temple Stay program at Hwagyesa Temple can enjoy Buddhist services, meditation, a forest walk, a tea ceremony, as well as conversations with the numerous international monks that call Hwagyesa Temple home. On the Seoul subway system, you’ll need to get to line #4 and get off at the Suyu subway station. After going out Exit #3, you’ll need to board local Bus #2 for an additional 15 minutes. You’ll need to get off at the Hwagyesa stop. Unfortunately, there is no information about the schedule on the Temple Stay website. You will need to contact the temple directly to gain more information about the program’s schedule. Regrettably, there is no fee information on the Temple Stay website. You’ll need to contact the temple directly. Hello Again Everyone!! Jogyesa Temple, in the heart of Seoul, was first established in 1910. When the temple was first established, a building from Gakhwangsa Temple in neighbouring Susong Park was transferred to the present Jogyesa Temple grounds in 1938. This building, which no longer exists, was funded nationally for Korea’s first Korean Buddhist mission. At this time it was renamed Taegosa Temple. The temple changed its name, after the Buddhist Purification Movement in 1954, to its current name of Jogyesa Temple. You first enter the temple, which is surrounded on all sides by stores selling various Buddhist items, through the entrance gate. The four pillars that support the gate are fronted by the Four Heavenly Kings in beautiful metal form. As you step into the temple courtyard, you’ll notice the ten-tier stone pagoda. The massive main hall occupies the majority of the compact temple courtyard. The exterior walls are adorned with some masterful Palsang-do murals, as well as some stunning floral latticework. Inside the always busy main hall sits a triad of very large statues centred by Seokgamoni-bul (The Historical Buddha). To the left of the main hall is the temple’s elevated bell pavilion, which is joined by the Yeongsan-jeon. There are an assortment of administrative buildings in this area, as well as the temple’s gift shop. To the rear of the main hall is the Central Buddhist Museum. If you have the time, the museum is well worth a visit. Most prominent, it houses National Treasure #126, which is the Sarira Reliquaries from the Three-story Stone Pagoda of Bulguksa Temple from around the 8th century. HOW TO GET THERE: There’s one of three ways that you can get to Jogyesa Temple. The first is from Jonggak subway station (line 1). Go through exit #2 and travel straight for 70 metres. You’ll then need to cross the street and go an additional 100 metres, where you’ll finally see the temple. The second way you can visit the temple is by getting off at Anguk subway station (line 3). Go out exit #6 and go straight for 50 metres. You’ll then need to cross the street in front of Dongduk Gallery. The temple lies an additional 50 metres straight ahead. The third way that you can get to the temple is by getting off at Gwanghwamun subway station (line 5). Take exit #2 and go straight for 150 metres. The temple lies between YTN Parking Tower and Hana Bank. OVERALL RATING: 8/10. The massive main hall, in its own right, is enough reason to visit Jogyesa Temple. The beautiful murals and latticework that adorns the main hall only help to elevate its beauty. Inside this large hall are equally large sized main altar statues. Add into the mix the metal Heavenly King artwork at the temple entry, as well as the Central Buddhist Museum, and you have more than enough reason to get to this easily accessible temple in the heart of Seoul. The entry gate at Jogyesa Temple. One of the unique metal Heavenly Kings. Another up-close of a Cheonwang. The ten-tier stone pagoda in the centre of the temple courtyard. The hovering temple bell pavilion. A look towards the massive main hall. Some of the hanging temple artwork just outside the main hall. The floral latticework adorning the main hall. Just one of the masterful Palsang-do murals. A look inside the packed main hall. The equally large Seokgamoni-bul altar statue. The Yeongsan-jeon hall to the left of the main hall. A sign for the Central Buddhist Museum. A look at National Treasure #126. The Serene Mireuk-bul at Bongeunsa Temple in Gangnam, Seoul. Bongeunsa Temple was first established in 794 A.D. by the monk, Yeonhoei, and it was first known as Gyeongseongsa Temple. Later, in 1498, under Queen Jeonghyeon (1462-1530), the temple was refurbished and renamed Bongeunsa Temple. Originally, the temple was located a further one kilometer southwest of its present location, but was relocated during King Myeongjong’s reign (r.1545-1567). More recently, Bongeunsa Temple is in dispute with the Seoul municipal government in potentially relocating it from its posh Gangnam neighbourhood. Bongeunsa Temple is nestled next to Coex on the south shores of the Han River. You first approach the temple past the Jinyeomun Gate that houses the rather peculiar looking Four Heavenly Kings. Just past this gate, and a little to the right, is a stupa field of past prominent monks from Bongeunsa Temple. A little further up the paved pathway, and you’ll pass under the large sized Beopwang Dharma Hall. Straight ahead, and up a set of stairs, is the main hall that’s fronted by hundreds of white paper lanterns and a three tier pagoda. Just to the right of the main hall is the historic Seonbul-dang, which formerly held the monks’ exam. Presently, it looks to be the Gwaneeum-jeon, with a serenely crowned Gwanseeum-bosal (The Bodhisattva of Compassion) sitting on the main altar. As for the main hall itself, and adorning the exterior walls, are two sets of paintings: the Shimu-do and Palsang-do murals, as well as a few scary guardian murals. Sitting on the main altar inside the main hall, which is almost always busy with devotees, are a triad of statues. Sitting in the centre is Seokgamoni-bul, who is joined on either side by Yaksayore-bul (The Medicine Buddha) and Amita-bul (The Buddha of the Western Paradise). To the right of the main hall, and just past the Seonbul-dang, is the Jijang-jeon. The exterior walls to this beautiful hall are adorned with judgment murals, the Ten Kings of the Underworld, as well as Jijang-bosal (The Bodhisattva of the Afterlife). Inside this hall, the walls are lined with murals dedicated to the Ten Kings of the Underworld. On the far left wall hangs a Gamno-do mural and sitting on the main altar is a green haired Jijang-bosal. To the left of the main hall, and up a flight of stairs, are a collection of shrine halls. To the far right is the Yeongsan-jeon (Vulture Peak Hall). In the centre sits the Bukgeukbo-jeon, which is dedicated to Chilseong (The Seven Stars). And the remaining hall is the Yeong-gak, which houses murals dedicated to master monks. But the crown jewel of the temple is the massive statue dedicated to Mireuk-bul (The Future Buddha). The 23 metre tall statue of Mireuk-bul looks out over the city of Seoul with a serene smile on his face. At the base of the statue are an assortment of Vajra warriors to help protect the Buddha from any harm. You can get some pretty amazing pictures of Seoul from this vantage point. The statue is fronted by an open Mireuk-jeon Hall. HOW TO GET THERE: On the Seoul subway system, you’ll need to take Line 2 to Samseong Station and go out exit #6 to get to the temple. Once you’ve exited the station, you’ll need to go straight for 600 metres and turn left. From there, you’ll need to cross the street and travel an additional 150 metres to get to Bongeunsa Temple. OVERALL RATING: 8.5/10. For such a centrally located temple in the heart of Gangnam, Bongeunsa Temple is rather large in size. The temple houses a handful of temple halls that can be visited at any given time. Some of the more notable halls that should be visited are the Daeung-jeon and the Jijang-jeon. The views are spectacular, as is the massive statue of Mireuk-bul, that overlooks the downtown core of Seoul. The Jinyeomun entry gate at Bongeunsa Temple. The stupa field at Bongeunsa Temple. A closer look at the beautiful Dharma Hall. A look up at blue skies and the main hall. A look inside the Daeung-jeon at the main altar with Seokgamoni-bul in the centre. Just to the right of the main hall is this statue of Gwanseeum-bosal inside the Seonbul-dang. The stairs that lead to the upper courtyard at Bongeunsa Temple. A look inside the Yeongsan-jeon at the main altar. The picturesque statue of Mireuk-bul. The Jijang-jeon on the lower courtyard. Just one of the amazing paintings adorning the Jijang-jeon. And a look inside the Jijang-jeon at the main altar. The International Seon Center first opened its doors on November 15th, 2010. The center was opened so that both Koreans and ex-pats could enjoy and experience Korean Buddhism. In total, the center consists of nine floors. The first two underground floors are reserved for parking, while the final underground floor is reserved for the Education and Culture Hall. The first floor of the building houses the center’s office and restaurant. The third and fourth floor, respectively, house the Event Hall and the Dining Room. The fifth floor, and the floor you’re probably most interested in, is reserved for the Temple Stay Program; while the sixth and seventh floor consist of the monks’ living quarters and the Geumcha Seon Hall (or the Practice Hall). As you can see, this center truly has it all. 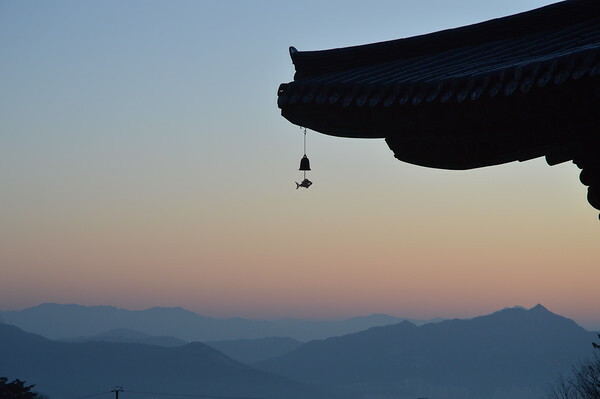 The Temple Stay program at the International Seon Center focuses primarily on meditation. In addition, you can also enjoy making prayer beads, learn about a traditional Buddhist meal, or have a dharma talk. You can also enjoy the Dharma Talk program, which takes place every Saturday night for both beginners and advanced practitioners of Buddhism. (Courtesy of the International Seon Center website). To get to the International Seon Center from Seoul, you’ll need to take subway line #5 to Omokgyo Subway Station. Exit out exit #8 and walk straight until you get to the first intersection (there will be a bank on the corner). Turn left at this intersection and walk straight until you get to the Mokdong Middle School, which will be on your left. Across the street from this middle school is the nine-story International Seon Center. The International Seon Center runs two different types of programs. The first is the typical, one night, two days program, where participants get to live like a Buddhist monk. The other program is on Saturday night, and it’s a Dharma Talk where both beginners and advance practitioners are actively encouraged to participate. Here are the two schedules for both programs. Adults: Free – Donations Welcomed (Saturday Dharma Talk). Reservations for the Temple Stay Program at the International Seon Center. For more information on the Saturday evening Dharma talks. The beautiful courtyard at Changgyeonggung Palace in Seoul. After visiting Seoul recently, I thought I would dig some pictures out of the archives and talk about Changgyeonggung Palace. While not quite a temple or hermitage, it is a beautiful historical compound that draws thousands upon thousands of visitors each year. It was a rainy day when I went, but the palace was still just as beautiful as ever. Changgyeonggung Palace(“Palace of Bright Rejoicing”) was first built as a summer palace by Goryeo King Sukjong. It was originally constructed in 1104, and it was named Suganggung Palace; however, in the 1390’s, the palace’s name was changed to Changgyeonggung, when the first king of the Joseon Dynasty took up residence at the palace while Gyeongbokgung Palace was being completed. Like all historic structures in Korea, Changgyeonggung Palace was destroyed during the Imjin War in 1592. Fortunately, the palace was rebuilt in 1616. A majority of the palace’s structures were reconstructed in the 1830’s after a devastating fire. Unlike most major palaces in Seoul that are facing north to south, Changgyeonggung Palace is positioned east to west, which was apparently a Goryeo orientation method. When you first approach the palace from the footbridge from Jongmyo Shrine, you’ll be greeted by an assortment of stone structures strewn upon the descending hill that leads to Changgyeonggung Palace from the south. One of the stone structures is Gwancheondae, which is an astronomical observatory built in 1688. Continuing down the path, you’ll first come across Honghwamun (“Gate of Vast Transformation”). This large gate aligns with the throne hall. As you approach the main courtyard to the palace, you’ll cross over the customary bridge: Okcheon-gyo. It’s a twin-support stone bridge built in 1483. In all probability, it’s probably the oldest bridge in the city. But what makes this bridge so unique are the faces of the beasts that adorn the bridge. Crossing over Okcheon-gyo, you’ll next pass through Myeongjeong-mun gate, which allows you access to the main courtyard at Changgyeonggung Palace. Immediately before you is the beautiful throne hall: Myeongjeong-jeon (“Hall of Lustrous Government”). The present throne hall was constructed during the 1484 renovations. It apparently escaped the destructive war of 1592 and the devastating fire of 1830. As a result, it’s the oldest throne hall in all of Korea. What is also noteworthy about this throne hall are the finely carved haetae that protect the palace, as well as the finely carved stone phoenix that both stand on the staircase that leads up to the throne hall. Directly to the side of the throne hall is Munjeong-jeon, which was a rebuilt in 1986, and acted as a place to conduct daily business by the king. And to the rear of the throne is Hamin-jeon, which is an open pavilion. Set even further back of the throne hall is Tongmyeong-jeon, which was used principally as the queen’s residence. Up a staircase that is situated by a large boulder, you’ll climb these stairs north. You can really capture some stunning pictures of the palace from this elevated vantage point. Continuing north, you’ll come across Chundangji, which is a beautifully serene lotus pond. On the western side of the pond is a seven-tier pagoda of Chinese origins. Unlike Korean pagodas, this pagoda has a very tall base. This pagoda was originally brought to Korea in 1470. HOW TO GET THERE: Much like Jongmyo Shrine, you can get to Changgyeonggung Palace by crossing over the footbridge that links the two grounds together. To get to Jongmyo Shrine you can take the Seoul Subway to Jong 3-ga Station on subway line 1. You can exit out of #11. The entrance for Jongmyo Shrine is across from the Jongmyo Citizen’s Park from Jong-no. Admission to the palace is 1,000 won and it also covers the entry into Jongmyo Shrine, as well. The hours of operation for Changgyeonggung Palace are from Tuesday to Sunday (closed on Monday) from 9 a.m. to 6:30 p.m. April to October, from 9 a.m. to 5:30 p.m. November and March, and 9 a.m to 5 p.m December through to February. Also, you can only be admitted to the palace one hour before closing. OVERALL RATING: 8/10. Equal to Jongmyo Shrine in size and importance, Changgyeonggung Palace rates equal to its attached complex to the south. The highlights to the palace are the uniquely sculpted Okcheon-gyo bridge with its fiercely carved sculptures, the oldest throne hall in Korea, and the tranquil lotus pond to the rear of the palace buildings. For all these reasons, Changgyeonggung Palace is worth the trip either to both Jongmyo Shrine or all by itself. So if you’re in Seoul make sure you drop by one of the more unique palaces in the nation’s capital. A little hike through a wooded forest that connects Jongmyo Shrine with Changgyeonggung Palace. This is Gwancheondae, which is an astronomical observatory built in 1688. The approach from south of the palace. The massive Honghwamun (“Gate of Vast Transformation”), which aligns parallel to the throne hall. Unlike most palaces in Seoul, this palace runs east to west. The first glimpse at the outskirts of the palace walls. A view of Okcheon-gyo: a twin-support stone bridge built in 1483. Another view of the ancient bridge. A look at Honghwamun gate from Myeongjeongmun gate. A look at Myeongjeongmun gate and the courtyard from the throne hall. The beautiful and oldest throne hall in all of Korea: Myeongjeong-jeon (“Hall of Lustrous Government”). The beautiful throne at Changgyeonggung Palace. The intricate hallways directly behind the throne hall. Neighbouring palace buildings with a massive stone as flooring at the palace. A beautiful vantage point to take pictures of the palace. Chundangji: The Royal lotus pond at the back of the palace compound. A path that kings and queens walked upon. This seven tier pagoda originated in China and it was brought to Korea in 1470. One last look at the lotus pond before we left Changgyeonggung Palace in Seoul.